Are you ready for some football? Yes…. and no. My 7-year-old is ready to play – mentally and physically – but is he safe? I think not. He’s playing flag football through the Minneapolis Parks & Recreation program where the only piece of protective gear for his program level is a mouth guard. If the program were about the fundamentals, drills and strategy, I’d be less concerned. However, this group of first graders is playing football for the first time in an organized program (unless they have played through a private league), and it’s mostly about contact in a game. They spend 30 minutes on drills during their Wednesday night sessions and the remaining 30 minutes on Wednesdays plus another hour on Saturday mornings playing ball. 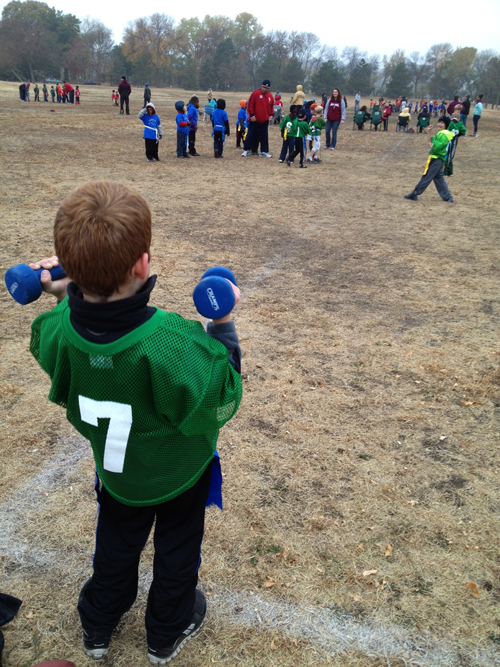 I have been challenging my husband for years on signing up our son, Calvin, for football. He’s an advocate, I’m into other options. The writing has been on the wall – he would play somehow, someway. We’ve signed up for some football alternatives – namely soccer. When Calvin was five, he and his sister two years older, kicked it on the soccer field. And after a freezing cold fall season when asked what they liked best about the game, the unanimously agreed that it would have to be the sideline. A tad bit infuriating to hear. One night this season, my son complained of an injury and lobbied not to go to Wednesday night football. I sensed the injury was a ploy so insisted that we go to support the team and listen in on the coaching strategies. After all, my husband is the head coach (he signed up as assistant and was immediately promoted to head, as does oft happen in these programs) and since he was out of town, I was in charge of getting Calvin to the game. He stood on the sideline before sneaking away to the nearby park to hop on the swings with his sister. I reigned him in. Then he couldn’t resist the urge to kick around the soccer ball with a 4-year-old on the sideline who was there because his older brother was on the team. I let him kick it out. Clearly, there was no injury. Twenty-five minutes into practice, I pulled Calvin aside and noted that he looked ready to play. Finally he agreed to get in the game. The boys have varying degrees of skill sets, physical size, interest and understanding of the game. Practice and games can be quite chaotic. Just two grades up, on the field adjacent, third-graders practice in full gear. There might be more contact, but at least they have pads and helmets. I would vote to make it mandatory for first and second-graders too. 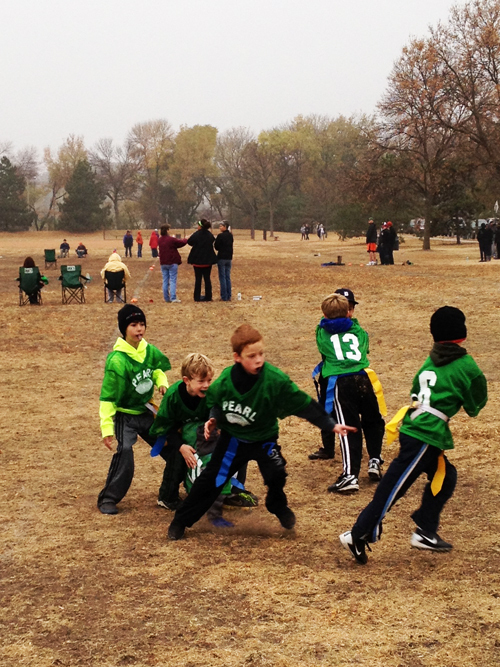 It is challenging to pull an opponent’s flag off of them without getting caught up in the speed and momentum (It can be done – see the video below where Calvin goes in for a touchdown (green team, jersey #7) and his opponent swipes and holds high Calvin’s flag). It doesn’t happen as often in practice, but a few teams our own Green Lanterns have played this season have been very physical – tackling, not de-flagging as the rules of the game instruct. I’m not trying to be extreme, rather, encourage that programs mandate protective gear. At least then I could be more relaxed on the sidelines. But not totally calm because I foresee the escalating contact and hits to come if he continues with football. Coincidentally, the other team’s quarterback goes down screaming on the last play of the game due to a twisted or broken ankle. Game over. Don’t get me wrong, I enjoying watching my son play as much as the next mom, but in light of recent research about concussions and long-term effects of the game, you can bet I’ll keep pushing alternatives. Calvin says he’s ready to play soccer this spring and as much as I dislike the term, I could get used to being called a Soccer Mom. It was a cool and dusty fall Saturday afternoon in Minnesota (yes, it gets dusty here). 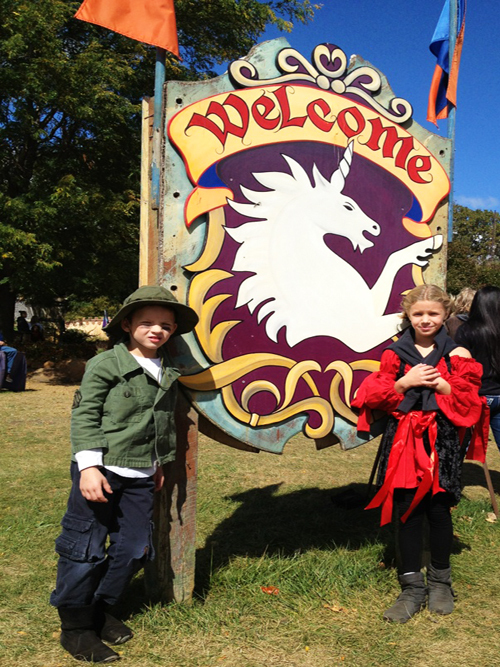 Your options are: pick apples at an orchard or head to the Renaissance Festival. We opted to fest and as it turns out, it serves as a Halloween trial-run. We pull out our Halloween boxes and try to explain the fest dress to my 7 and 9 year-olds so they will have a few ideas for their persona for the day. My husband starts by channeling Shrek. We reference pictures from a few years back when we bid and won a silent auction for full outfitting by Sandy Brown of M’Lord and Tailor. We offer extreme interpretations of the Medieval age – a hobo and a pirate. They take us up on it. 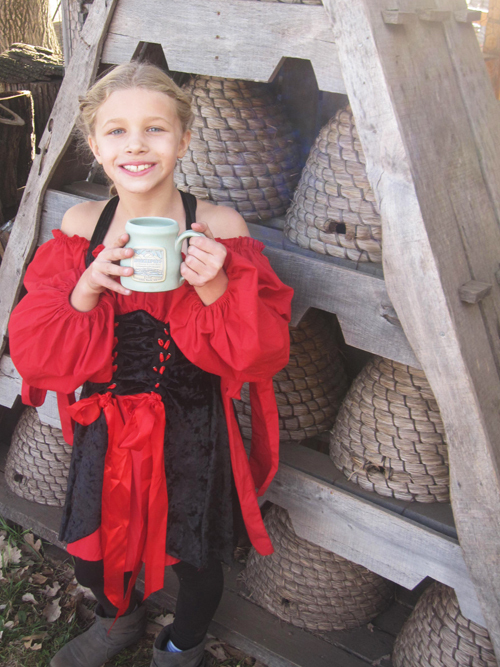 Ava, my 9-year-old, recalls a dress of mine from Halloween’s’ past and somehow locates my pirate costume. We make some slight adjustments. Calvin, my 7-year-old, will work any excuse to wear his Dad’s old army jacket and black jeans with a good 6″ rip across each kneecap…. oh and his sister’s black boots from last year. My husband, a lover of Halloween, goes all or nothing for this type of thing. It was nothing today. I admire that. I fall into a nondescript middle-of-the-road option with a tan suede skirt and boots. We have a full day lined up. My son has a 10:00 -11:00 football game coached by his Dad so the plan is to leave right after that. That did not quite happen, but all just as well as the party we were scheduled to meet up with — my brother, Paul, and his wife, Katie — was running late too. We arrive in Chanhassen for the fest (a good 25 minute drive from our house) at 12:45. The parking lot is full. By the time we entered I was starved. I grab and map and we hang a hard left and I b-line for the soup line. A long line ensured popularity, right? I opt for the tomato basil soup served ala breadbowl for $7.50. I couldn’t for the life of me locate my husband and kids at this point, so continue on. I finish the soup and decided to hold onto its breadbowl container until my brother and/or kids say they do not want it. After loosely informing our second party on our whereabouts, I randomly ran into them. Text to husband: We are at Ye Old Pub, join us here. Unbeknownst to us – there are chain pubs, stores and retail outlets in Medieval times too. Ye Old Pub has numerous locations, so does Ye Old Blacksmith and Jacob’s Ladder. At this point, I could see that the writing (texting) was on the wall and the tone of wayfinding challenges was set for the day, despite the most elaborate picture map they provide. After finding our way to the pub, my brother and I get a beer while adhering to their strict one beer per person per trip rule. They ID too. All of the “hosts” at the fest are actors posing as townspeople. They help people get food and drink to your group. You can actually call out for help with this. We get sassy with these staged townspeople — they love to push buttons — and respond to the noble 19-year-old pub manager’s request to throw away my empty plastic cup with a Do you recycle in Medieval times? Paul, Katie and I visit the Mermaid’s Cove and share a turkey leg,while no less than 25 texts are exchanged to find the whereabouts of my husband and kids. Annoying! They move quick. We finally merge the group in the NW quadrant around 2:45, a mere two hours after we entered. We test out the Crystal Stix (video) then move on to the Blacksmith and Walking Stick stores (an artist crafts wood-swirling walking sticks from the leftover broken jousting wood that are covered with glitter). My Ava is dying for one of these. I’m thinking yes. Anything to replace the tree branches she collects and brings into the car for travel. 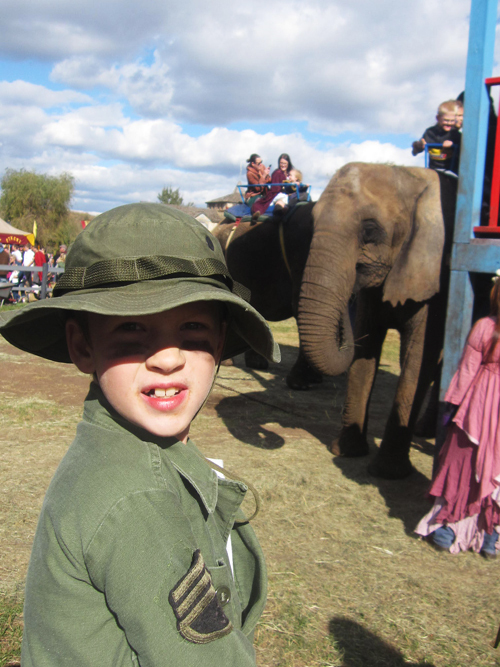 The kids ride on an elephant. 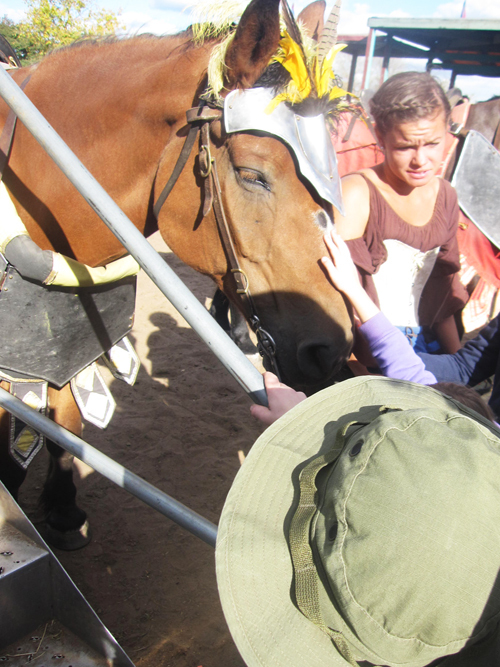 We watch jousting matches and scout out good honey and garlic. The dust settles. They are tired. We do a quick vote and agreed to head home. It’s 5:00 which puts this at a three hour outing. I could have stayed longer or been more enjoyably text-free while I was there. The kids are agreeable, if not oddly crazed on the long ride home. One kid actually has to pee in his/her Renaissance mug because traffic is horribly backed up at the Huron exit to drop off Chad for the Gopher’s game. They are in stitches so much over this that I’m convinced that will be the only memory ingrained upon them from this day. Next year, you can be sure I will plan dress/costume in advance, arrive early, plan to stay late (minimum five hours required! ), allow time for facepainting, hairbraiding, lines of all sorts, shows (Bad Manor is a good way to experience the theatrical effects (we went in 2010)) and leisurely lounging. The kids enjoyed it and warmed up to the fact that anyone, anywhere could heckle you about anything and you were required to respond or run. Although don’t run to far — you are sure to be split up from your party and experience wayfinding issues if so. Oh, and good luck finding your car in the parking lot.